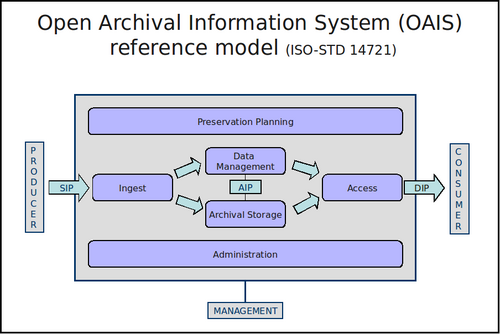 Archivematica provides an integrated suite of free and open-source tools that allows users to process digital objects from ingest to archival storage and access in compliance with the ISO-OAIS functional model and other digital preservation standards and best practices. All of the Archivematica code and documentation is released under AGPL and Creative Commons open-source licenses. Archivematica implements a micro-service approach to digital preservation. The Archivematica micro-services are granular system tasks which operate on a conceptual entity that is equivalent to an OAIS information package: Submission Information Package (SIP), Archival Information Package (AIP), Dissemination Information Package (DIP). The physical structure of an information package will include files, checksums, logs, submission documentation, XML metadata, etc.. These information packages are processed using a series of micro-services. Micro-services are provided by a combination of Archivematica Python scripts and one or more of the free, open-source software tools bundled in the Archivematica system. Each micro-service results in a success or error state and the information package is processed accordingly by the next micro-service. There are a variety of mechanisms used to connect the various micro-services together into complex, custom workflows. Micro-services can be distributed to processing clusters for highly scalable configurations. The web dashboard allow users to process, monitor and control the Archivematica workflow processes. It is developed using Python-based Django MVC framework. The Dashboard provides a multi-user interface that reports on the status of system events and makes it simpler to control and trigger specific micro-services. This interface allows users to easily add or edit metadata, coordinate AIP and DIP storage and provide preservation planning information. Notifications include error reports, monitoring of MCP tasks and manual approvals in the workflow. The dashboard also supports a transfer backlog linked to accession data as well as indexing, analysis, arrangement and minimal description of transfer(s) into SIP(s). An administration area allows users to manage storage locations, configuration of micro-services, alteration of preservation plans and user access levels. 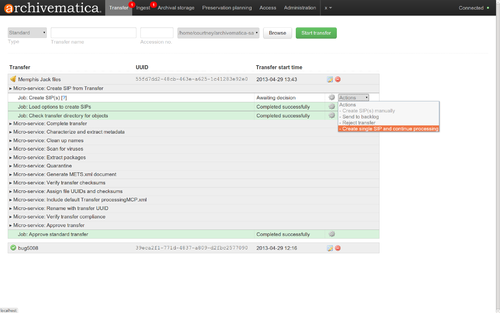 Archivematica maintains the original format of all ingested files to support migration and emulation strategies. However, the primary preservation strategy is to normalize files to preservation and access formats upon ingest. Archivematica groups file formats into format policies (e.g. text, audio, video, raster image, vector image, etc.). Archivematica's preservation formats must all be open standards. Additionally, the choice of formats is based on community best practices, availability of free and open-source normalization tools, and an analysis of the significant characteristics for each media type. The choice of access formats is based largely on the ubiquity of web-based viewers for the file format. Archivematica format policies are managed in a structured, online format policy registry (FPR) that brings together format identification information with significant characteristic analysis, risk assessments and normalization tool information to arrive at default preservation format and access format policies for Archivematica. This registry is synced with PRONOM, and the goal is to ultimately integrate other registries like the Planets Core Registry and/or the Universal Digital Format Registry (UDFR). Archivematica installations use the FPR to update their local, default policies. Users are free to determine their own format preservation policies, whether based on alternate institutional policies or developed through the use of a formal preservation policy tool like Plato. The system is configured to make it simple to add new normalization tools and customize local format policies. 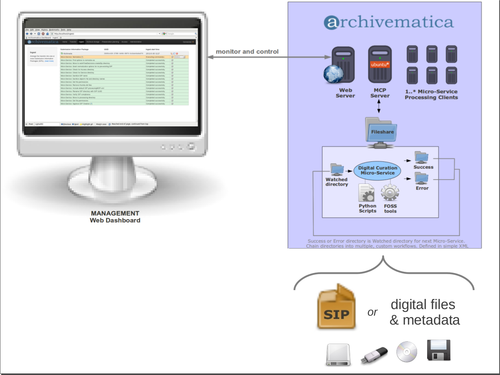 The primary function of Archivematica is to process digital transfers (accessioned digital objects), turn them into Submission Information Packages (SIPs), apply format policies and create high-quality, repository-independent Archival Information Packages (AIP) using METS, PREMIS and Bagit. Archivematica is bundled with AtoM, but is designed to upload Dissemination Information Packages (DIP), containing descriptive metadata and web-ready access copies, to several access systems (e.g. Dspace, ContentDM, etc.). Code contributions, bug reports, wiki documentation updates along with questions and feedback on the discussion list are strongly encouraged and welcomed. Commercial licenses and commercial use of the Archivematica name and logo trademarks may be negotiated with Artefactual Systems on a case-by-case basis. Digital preservation systems must implement strategies that deal with technology obsolescence and incompatibility to ensure that digital objects remain authentic, accessible and useable for future use. The technologies that create digital objects and the technology available to manage them are constantly changing. Therefore, the Archivematica project has established an agile software development methodology to manage the perpetual maintenance and development of the system. This methodology is focused on rapid, iterative release cycles, each of which improves upon the system's architecture, requirements, tools, documentation, and development resources. This page was last modified on 9 March 2017, at 21:41. This page has been accessed 93,290 times.